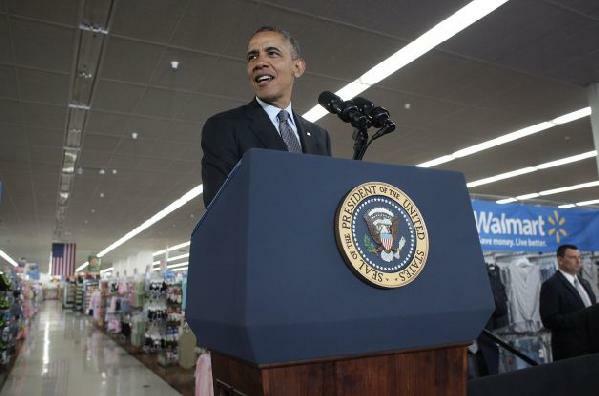 *Pam Ramos was excited to hear that president Barack Obama would be visiting the Walmart store she has worked at for the past four years in Mountain View, a city in the Santa Clara County section of northern California. The president was in Silicon Valley to engage in fundraisers for the DNC, and would also visit Walmart to speak on the important of energy efficiency; especially since the store has a goal of powering its facilities with 100 percent renewable energy according to The San Jose Mercury News. But Ramos’ excitement died and she knew her already slim chances to get a word with Obama went with it when she learned the store would shut down a few hours in advance to prepare. Just like the family having company and running around to clean areas they’d neglected for months, Walmart didn’t want any disgruntled employees around to mess up the best foot they planned to put forward.